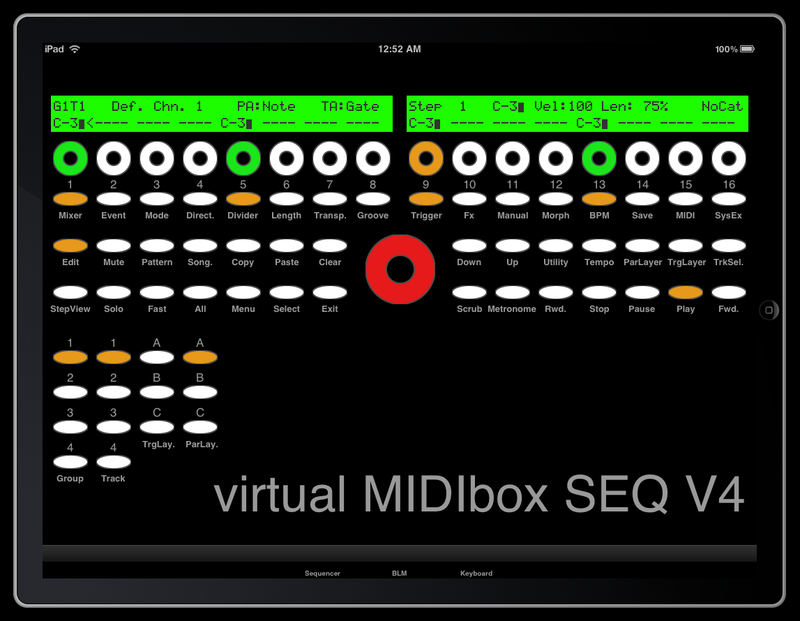 Here a first impression of the virtual MIDIbox SEQ V4 for the iPad. I'm a registered and active iPhone/iPad developer and I have an iPad here if you'd like me try out some code. You can download the code from the command shell with "svn co svn://svnmios.midibox.org/mios32"
It would be especially interesting if the virtual encoders are working properly. Note that MIDI output isn't implemented. I've heard that MIDI is provided via Bonjour, but haven't found documentation about this approach yet. I'm curious how you see the role of touchscreen devices for the purpose of implementing largish BLMs (say 16x16)? I've got my SEQV4 nearly finished (just waiting on front panel/case), and I'm not sure in the future whether to choose hardware or software BLM. Also I wonder if there will be cheaper touchscreen devices than the iPad, that still provide a useful interface. Well, when I saw the first iPad videos my first idea was, that this is the ideal platform for a virtual BLM, not at least because of the multi touch capabilities which is the key for such kind of applications. I'm not sure if I still need a HW based BLM for myself anymore. The main advantage of the SW solution is the flexibility - you can quickly change the application to use the device for a different purpose, accordingly it saves some place on the desk. I understand what you mean - software is so flexible. I wonder if the responsiveness of the iPad's touchscreen will provide for a satisfying experience? I assume it will be fine for non-timing critical button pushes, not sure about things like virtual encoders and XY pads etc. This also requires good latency from the WiFi OSC connection. Unfortunately for me I think the iPad will be more expensive than a hardware 16x16 BLM (discrete button + led, not illuminated buttons), and I have no other reason for getting an iPad. :frantics: I'll have to work out total cost of all buttons, leds, PCBS and extra panels/casing from Ponoko. If I'm going to buy a tablet device I'd also like better connectivity options than the iPad offers - we'll have to see what HP, Google etc. bring out. Do you still plan to add the code to support the hardware 16x16 BLM? The code to communicate with a BLM via MIDI is already integrated into the MBSEQ firmware and tested (with the virtual BLM). It won't be possible to connect a BLM16x16 directly to the MBHP_CORE_STM32 module which runs the MBSEQ firmware, therefore a second uC (a PIC) will be required. The BLM code which runs on a PIC has been started, but currently only supports 4x16 since I don't have a 16x16 HW ready yet to add and check the required changes. The project isn't documented yet, and it definitely needs some more work before somebody could start to build the project. Since I've already the required 256 buttons and Duo-Colour LEDs, I will build at least the basic HW on veroboards (nice relaxing work ;)). An iPad app that I'm using named AC-7 Pro is a Mackie Control emulator uses a Mac client called DSMidiWifi to receive from the iPad and transmit over virtual midi ports. It also used a midipipe setup to alter some messages. So from that it seems like running a client on the mac is necessary, but bonjour does seem like it would be a whole lot cooler. I'm at a developer conference called iPadDevLA this weekend, but I'll test out that project later today or tomorrow. This work very fine with all computers with ethernet and ipmidi. Interesting app, but 79$!?! yikes. It can't be that hard to recreate it. Source for it would be needed to make use of that protocol on the iPad. I say we create an open MIDI UDP and TCP/IP Standard if one does not already exist. The proprietary stuff is ridiculous. BTW: I've been trying to get the iPad project to build for the device and oddly it has compile errors when device is selected. There is some crazy stuff you are doing there TK and I think some of the C to Obj-C bridging might be a little wrong from what I've been able to tell so far. I'm continuing to look into it, but I need to do some work for a client this evening, so I may have to pull myself away. It runs just fine in the simulator, but with this Mac Pro its hard to tell how much it will slow down on the actual device. I'll post some video when I get it going. Success. Video on the way. I already feared that the GP knobs are too small, but I will try to improve the touch handling with tap and stretch gestures. As a workaround, you can already use the big datawheel to change the last selected value. I noticed in the video, that the response of the buttons is sometimes too slow (resp. sometimes they don't switch) - probably the LCD emulation consumes too much time and therefore has to be optimized. Too bad that the UI doesn't provide priority task handling like FreeRTOS - this would simplify things a lot. The response seems fine, but my fingers are big and those buttons are small. 40x40 seems to be the UI standard to iPhone and iPad. Seems like there is lots of space for UI options here. It would be fine if the LCD encoders were buttons and the main knob was all you turned. I had to comment out the two sprintf's, and snprintf to get it to build for the device. The right LCD is corrupted when it starts, but seems to fix up when you press any buttons or encoders over there. The app crashes when I let it sit.. memory leak? The MacOS Client is for free! Ok, so far! I saw the Youtube Video an i think the Knobs Solution wonÂ´t work for (Wurstfinger) wide-fingers. ItÂ´s a Touch Panel..... why not touch direct into the MBSeq Display. A tap on a note in the Display poups a dialog to choose the right note. A dropdown dialog! This creates more Space for other important Buttons! Yes, different page views for more comfortable parameter entry makes sense and they are easy to realize. Memory leak: I will check this once I get my hands on the real device - otherwise debugging will be too time consuming. I'm not sure what those __builtin___* functions are, or why they only conflict when building for the device. On the possible leak, I think it took about a half hour before it quit. Ok, so it's probably better to remove this file (remove the reference only!) from the compile list - in this case, the non-optimized libc printf() functions will be used. ipMIDI sends simple raw MIDI data over Multicast UDP. The protocol is not proprietary. 79$ is the 3-client windows version. I am not experienced with iphone/ipad development. With Windows notebooks I had problems with the power saving modes of the WLAN NICs. If enabled you can expect a high latency. Guys, there is no real need to discuss about MIDI options via ethernet. As mentioned before, there seems to be a standard solution for the iPad provided by Apple. Alternatively, I've already developed a OSC->MIDI proxy which is really simple to use and which will very likely also run on the iPad. A more general version (based on Juce) will be developed so that it also runs under Windows w/o adaptions. Thats the most flexible solution, no? OSC would certainly work, but as you've documented elsewhere its a bit slower and is certainly a much thicker wrapper over the midi data than ipMIDI, which looks really awesome to me. Right now, I think any midi iPad apps that I work on are going to use that. What I was trying to say before is that there is no standard solution provided by Apple that I can tell of. At the time I wasn't really sure, but having just looked at "Core Audio Overview" in the iPhone documentation set, it clearly shows that CoreMIDI.framework, and CoreMIDIServer.framework are not available on the iPhone at all. Crazy huh. Yes OS X has a standard MIDI to Ethernet component, but its not available to even be accessed by mobile devices other than laptops. So this is why the one iPad app that I have right now uses DSMidiWifi. If ipMIDI becomes a defacto standard, it shouldn't be a big problem to provide it as an alternative option. The protocol is simple but primitive compared to OSC. I guess that the transfer performance is almost identical.